Blog Project Safety Tips	Do You Know What’s Growing in your Gutters? You may have seen them around your neighborhood, or perhaps on your own house – weeds growing in the gutters. How does this happen? It’s easier than you think for the condition of your gutter system to deteriorate to the point where weeds can actually grow and thrive in them. Gutters can become the perfect spot for weed and tree seeds to germinate. If your gutters don’t slope down enough towards the downspout, water will drain more slowly during a rainstorm. 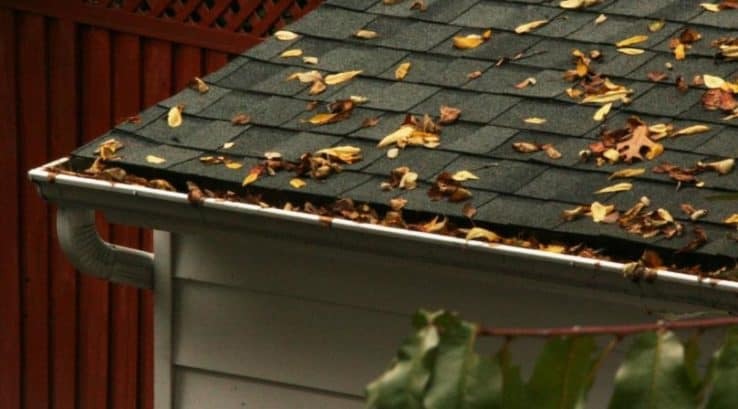 This causes leaves and other debris to build up in your gutters. Over time, the leaves will break down, creating composted material that wind-blown seeds find perfect for germination. Your gutters should slope down towards your downspouts for better drainage. Experts recommend a quarter inch to half inch slope for every 10 feet of gutter. To check your gutter slope, climb up on a ladder and look down the length of your gutters. Look for any areas that are higher or lower. Sometimes you can bend the gutter hangers slightly to correct the slope. If the slope needs more adjustment, you can reset the gutter by removing a couple of the hangers, reposition the gutter for the proper downward slope, and reattach hangers. Proper gutter slope is also critical to control mosquitoes – they prefer to lay eggs in stagnant water such as that found in improperly-sloped gutters. You should also make sure that your downspouts are not clogged. Clogged downspouts cause water to back up and sometimes overflow from your gutters during a heavy rain. This will cause leaves and debris to collect in the overflow areas of your gutters. To clear a clogged downspout, often a hard blast from your garden hose will do the trick. Place the hose at the top of the downspout, wrap a rag around the top, and spray water down the downspout. If this still doesn’t clear the clog, you can use a plumber’s snake. Regular gutter cleaning is a sure-fire way to keep stubborn weeds at bay. Clearing out leaves and twigs will prevent them from sitting in your gutters and breaking down into compost. Cleaning will also maintain the integrity of your gutter system by eliminating extra weight from debris sitting in the gutters and preventing holes or leaks. And when you clean your gutters on a regular basis, you can inspect them for any signs of early problems. Catching a problem early will usually involve a simpler, quicker, and less expensive solution than if you wait until the problem gets worse. A few simple tasks can eliminate gutter gardens. Inspect and correct the slope, keep downspouts clear and free of clogs, and regularly clean out your gutters. Then you can keep the greenery in your yard and out of your gutters!